PCE Instruments has used the experience of the recent years to develop a mobile, small and powerful data logger. The development and production were guided exclusively by the suggestions, experiences and wishes of the customers. For all the branches of industry, a new data logger of the PCE-VDL series offers solutions for the detection of 3-axis acceleration, for example, upon shock or vibrations. The first two data loggers PCE-VDL 24I and PCE-VDL 16I are now conquering the market after intensive and successful work. The PCE-VDL 16I has five integrated sensors for temperature, humidity, air pressure and light, as well as a 3-axis acceleration with a sampling rate of 1600 Hz. The PCE-VDL 24I has a very fast sampling rate of 2400 Hz. Thus, the PCE-VDL 24I is perfect for recording the acceleration, for example, during machine inspection and preventive maintenance. Due to its very small design, the data logger can be mounted at almost any point on the machine and used for 3-axis acceleration. With the PCE-VDL 24I, it is possible to measure and store a precise reconstruction of the pulses coming from acceleration and impact force in all three axes. Especially in case of machines, motors and generators, it is advantageous to be able to record the snapshots of variable process steps and to document all the abnormalities. Thus, future problems can be detected in advance and resolved, for example, when the velocity of various speed ranges drops and critical machine errors occur. The new data logger can contribute to the preventive maintenance of machines and noticeably reduce high service expenses. Additional information can be used to limit the number of areas affected by large vibration amplitudes and retrofit damping systems. 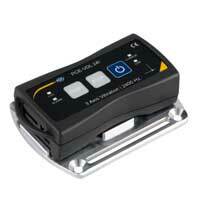 The data logger PCE-VDL 24I cannot only be used for stationary machines, it can also be installed in moving objects. Particularly in the field of industry and transport, it is advantageous to determine impacts, shocks and accelerations of objects in all 3 axes. Due to the constant presence of gravitational acceleration and its graphical and numerical illustration in the measurement results, even small changes in position, displacements and generally tilting movements in a three-dimensional space can be detected due to a high sampling rate with the highest resolution. With the PCE-VDL 24I, it is possible to display the exact time course and to put a time stamp during the recording of many measurement values. Only on this condition, the real processes can be made visible subsequently via an acceleration-time-diagram. Due to the high sampling rate of 2400 Hz, especially the higher frequency oscillations or vibrations coming from very short shock or impact pulses are definable. In the case of periodic oscillations with higher frequency components, a high sampling rate is urgently required in order to make the recordings and later evaluation on the PC possible. Diagrams give us new insights, for example about long or short peak loads, as well as the recording of very many measuring points at very short time intervals. With the data logger PCE-VDL 24I, effective machine monitoring is possible and can increase and prolong the performance and lifetime of equipment and machines.